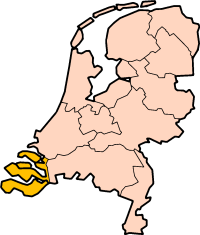 Zeeland is one of the 17 regions in Nederland. It is located in the south-western part of the country, and it is a river delta of several big rivers, consisting of a number of islands and a strip of land bordering Belgium. Most of the province lies below sea level. The latest great flood of the province was in 1953, killing an estimated 1,835 people. The country New Zealand was named after Zeeland. Zeeland has a population of about 380,000 and an area of about 2930 km², of which more than one third is water. Zeeland is a popular holiday destination, especially for Dutch and German tourists. The province is famous for the Delta works, that protect the land against the sea. The province has various dams and the longest bridge and the longest tunnel in the Netherlands. The Zeelandbrug (5,022 metres) was the longest in Europe at the time of it's completion in 1965. The Western Scheldt Tunnel (6.6 kilometre) was completed in 2003 and replaced two roll-on/roll-off ferries for cars, trucks, cyclists and pedestrians across the Western Scheldt. Currently one ferry for cyclists and pedestrians remains. Currently (April 2012) there are 1791 users in Zeeland and 9% (157) of them are HT-supporter. Zeeland is one of the smallest regions in terms of number of users. There is a federation that is linked to the region Zeeland: Zeeuwen in Hattrick. Former federations that are linked to a town or region within Zeeland include Kamperland Tournament Federatie, Zeeuws Vlaamse Hattrick Federatie and Wemeldinge United. The Zeeuwse Cup is a traditional cup, open to all teams that are either from Zeeland or have a strong relationship to Zeeland and Zeeuwen (people from Zeeland). Since the ZC was founded in 2004, is was held over 30 times in succesion and it is still held every season. This page was last edited on 23 July 2014, at 13:52.